I mentioned the other day that I’m trying to work more paperless tools into my life. This isn’t a crusade — I’m rarely a firebrand. In all honesty, I’m inclined toward inertia, and so I need to prod myself. I set up a wiki for myself some months back, mostly to see firsthand what the administrative side was like. 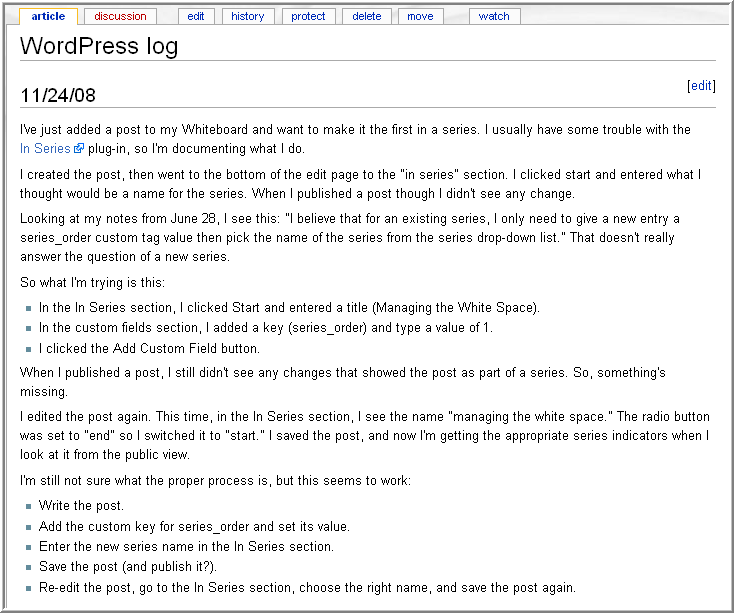 I was curious about how to control access to wikis as a whole, or to particular sections. My hunch (then and now) is that in many work settings, a limited wiki — one with a somewhat defined community — is an easier sell and possibly a more effective tool. I call my wiki Clio, after the muse of history. I probably should have used the name of her mom, Mnemosyne (the personification of memory), but that would have been too much typing. After reading Will Richardson’s Get. Off. Paper. post, Clio and I have been trying new ways to work together. I have a small spiral notebook for tracking anything I do with my blogs — especially the technical tinkering. I don’t know PHP (the code that underlies WordPress), and often when I add some plugin (an off-the-shelf piece of code to carry out a specific task), I have some fiddling to do. My tendency is often to plunge ahead, but the fiddling can go awry. So I treat the fiddling like a lab experiment and make myself note what I’ve tried, and why. The other day, I started a new series of posts. I’ve had some trouble in the past with the In Series plugin, though after trial-and-error I got it to work. This time, I opened my wiki and turned on Dragon NaturallySpeaking (voice-recognition software). I can talk (and Dragon can record) faster than I can write with a pen, and so I dictated my experiments with the plugin. What’s great about this is that next time I need this information, I’ll be able to search in Clio, instead of leafing through the spiral notebook. This isn’t exactly a mashup, but for me it’s a productive combination of two tools: my private wiki with Clio maintaining my “knowledge history,” and the voice software that saves me 90% of the typing. Very impressive. I’m inspired. Also, your statement “In all honesty, Iâ€™m inclined toward inertia” is further evidence that we probably were separated at birth. Janet, I’m afraid there’s a fine line between accepting my faults and embracing them.